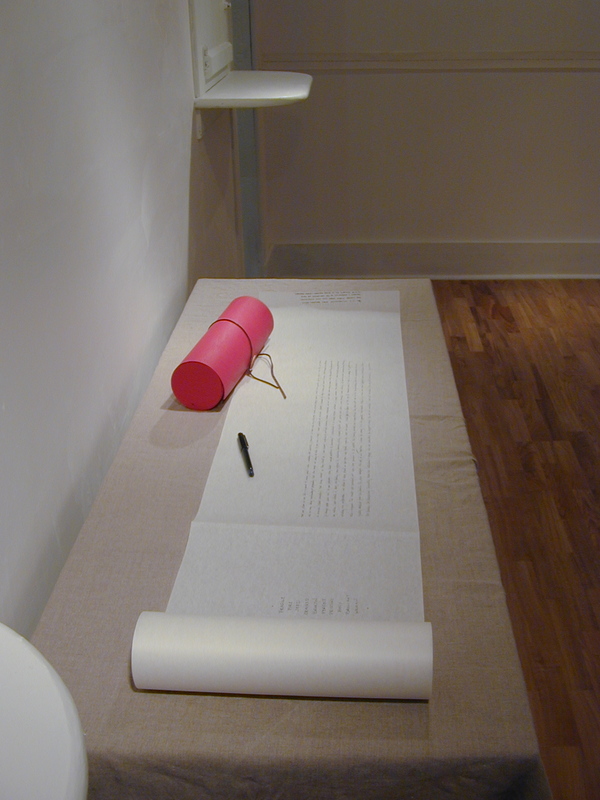 First exhibited in 2001, The Collaborative Scroll was part of an installation I created at the New Marlborough Meeting House in New Marlborough, MA. On that piece of paper I shared one of my deepest, most shameful secrets about childhood sexual assault. The night before the opening, I considered cutting that portion of the scroll off and choosing to exhibit it blank instead. Struggling with the fear of what I imagined the experience would feel like if I went ahead and exhibited the scroll (something akin to standing stark naked in the gallery during the opening reception, completely vulnerable, open and scared) I agonized for hours over what to do. Ultimately, I decided I had to keep my story in. . . If I hide my story than I’m just perpetuating the silence and protecting the secret. . . I have to break the silence, I want other victims of violence to see that they’re not alone and to know that healing is possible once we break the secret. . . 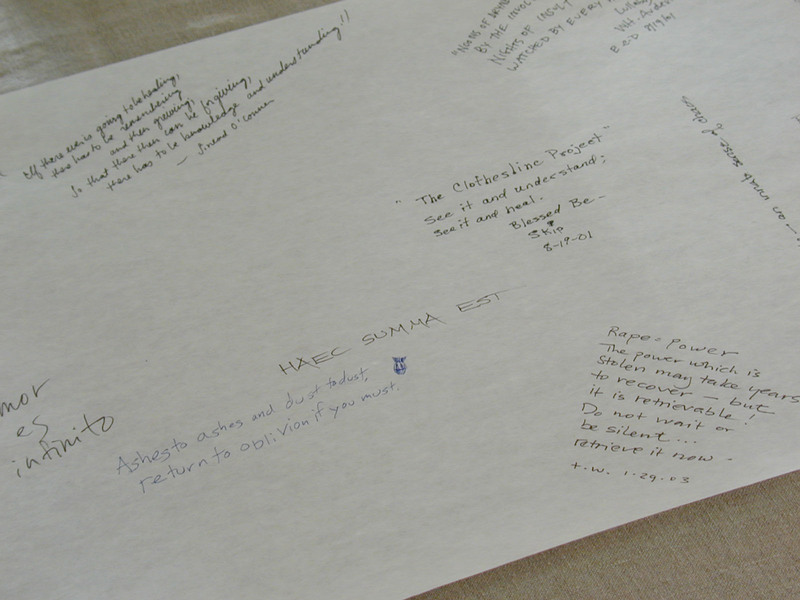 Since that time The Collaborative Scroll has travelled to dozens of locations, has grown to more than 20 feet long, and now contains hundreds of entries by people who have come upon it at events and exhibitions. In 2002 I received a Public Interest Grant from the Puffin Foundation to create The Online Collaborative Revelations Scroll, enabling me to make an electronic version of the scroll available to thousands of people around the world via the internet. In addition to references to personal trauma, great remorse and tragedy, there are also expressions of gratitude, release and joy. It is a step I never regretted taking.